Bakson's Sunny Herbals Cocoa Butter Cream softens dry skin, reduces pigmentation, fine lines and wrinkles. Reduces pigmentation, fine lines and wrinkles. Blends stretch marks & makes skin appear firm and more toned. A rich and advanced moisturizer with essentials of Aloevera & Calendula, that softens dry skin, reduces pigmentation, fine lines and wrinkles. It blends stretch marks & makes skin appear firm and more toned. 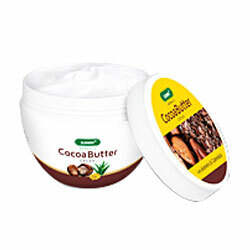 Cocoa Butter is among the best moisturizers as it penetrates through the outer layer of the skin to reach the layers below and repairs the skin effectively leaving it soft, refreshed and glowing. Shea Butter leaves the skin feeling silky soft. It stimulates the skin's renewal process, thus revealing a more youthful, fresh skin. Rub small amount gently onto skin until absorbed. Use twice daily or as often as needed.